Biblesoft's Biblical Language Study Bundle brings together the power of Girdlestone's Synonyms of the Old Testament and the Grammar of the Septuagint by F.C. Conybeare and George Stock. These references are extensively tagged and indexed to operate seamlessly with all of the rest of your PC Study Bible library references. Numerically coded to Strong's numbers for ease of use, this work is also indexed by Hebrew, Aramaic, and Greek words, scripture references and subjects. An essential resource for those seeking to increase their understanding of the Old Testament. To access the Girdlestone's article, go to the Greek or Hebrew word list menu, select the "By Strong's Number" menu, "Old Testament" and finally Girdlestone's Synonyms of the Old Testament. Enter an Old Testament Strong's Number. If Girdlestone's has any information on that particular number it will light the "Okay" button. To get a picture of the expansiveness of the Girdlestone articles, you may want to open it from the Books menu above the left-hand navigation column. You may also find information quickly by searching on the Hebrew transliterations, such as korban for offering and nagash meaning to draw near. Several hundred articles provide incredible thematic and semantic detail on an impressive array of Hebrew words and their synonyms. Extended commentary on select passages covered in the text is available through the Additional Commentary section of Commentaries. Indexes include usages of both Hebrew and Greek words, as well as an English list of topics covered. The author's transliteration scheme is quickly and completely searchable. With Version 5.2 all passages, topics, Strong's Numbers and original language words contained in the PC Study Bible Greek, Hebrew and Aramaic database display when hovered over. 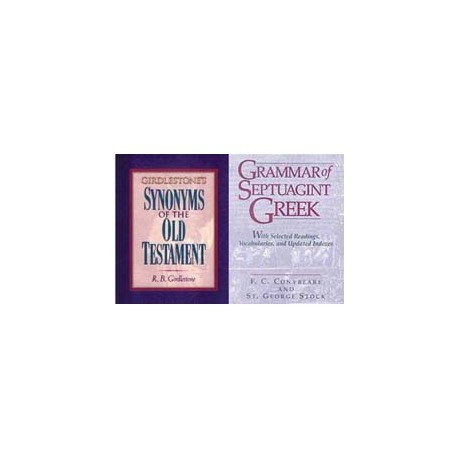 Grammar of the Septuagint Greek by Fredrick Conybeare and George Stock explains differences in the Koine Greek, in which the New Testament was written, and the classical Greek translation of the Old Testament which was utilized for the Septuagint. This is an ideal reader for anyone with some knowledge of Greek wishing to study the Septuagint in its original language. Full textual and grammatical notes that are especially helpful for the student of New Testament Greek wishing to develop language skills through reading less familiar texts. Helpful improvements include: new, updated indexes of ancient sources and significant Greek words from the readings; a convenient and complete vocabulary with definitions; and an alphabetical list of proper nouns from the readings, with translations. The extended readings with verse-by-verse commentary, makes Grammar of Septuagint Greek a much more valuable way to learn how the underlying Hebrew was translated. Included are explanations of variant translations that differ from the Masoretic text, as well as analysis that clarifies difficult passages in the Hebrew. All Old Testament and Apocrypha references are keyed to bring up the Septuagint text as a default. New Testament references are keyed to access the NA27. To allow for easy access to the Septuagint while in the textual commentary, every chapter and verse under discussion will be linked with the full Greek text of the verse available on hover with the Features-Plus 5.2 update add-on. Also available: Biblical Language Studies Collection for the New Testament and for the Old and New Testaments for a special discount price.